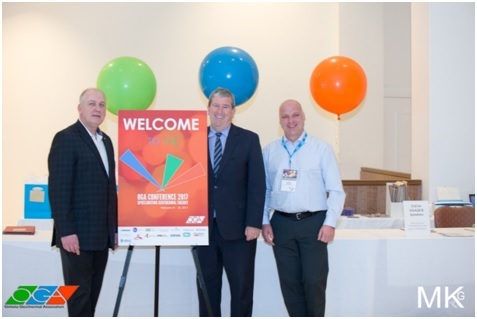 On February 21-22, the Ontario Geothermal Association (OGA) hosted their 7th annual OGA Conference - Spotlighting Geothermal Energy - which welcomed local and international leaders in the geothermal industry. The first day of the conference began with a welcome address from Jim Bolger, OGA President, followed by a Keynote Presentation made by Illinois-based Steve Smith, CEO of Enertech Global. Mr. Smith provided a detailed comparison of the cost of installation of a geothermal heating and cooling systems, and outlined what is needed to consider geothermal for residential and commercial installations. 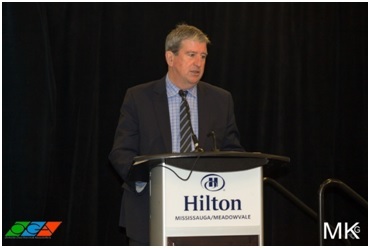 Ontario’s Minister of the Environment and Climate Change, the Honourable Glen Murray, kicked off the second day by addressing Ontario’s Climate Change Action Plan and the Role of Geothermal: What We’ve Done and Where We’re Going. Minister Murray re-confirmed the provincial government’s commitment to work with the geothermal heating and cooling industry on carbon-reduction solutions in the future. He praised the organization for their contribution to policy development so far. A notable international presence was Martin Forsén, Manager, International Affairs, NIBE, based in Sweden. He referenced the Swedish experience of the past 30 years to demonstrate that the goals set out by the Ontario government to limit GHG emissions from homes and buildings is, in fact, achievable. The success of reducing emissions to near-zero while also reducing energy costs for end users in Sweden has been due in large part to the wide-scale deployment of heat pump technology, especially ground source heat pumps. Over the past two years, NIBE has purchased several large geothermal heat pump manufacturers in North America, signalling that they see similar growth opportunities for the technology in this market. The “buzz” of the Conference was the presentation from Enbridge Gas Distribution VP of Market Development and Public Government Affairs, Malini Giridhar, who outlined Enbridge’s plans to aggressively increase their presence in the Ontario geothermal marketplace, focusing on the new home construction market initially. The two-day conference had a popular trade show component and provided an opportunity for guests to network. The conference also explored the opportunities for geothermal in a variety of markets and applications, addressed what needs to be done to realise these opportunities, and what industry participants can do to help make the Ontario Geothermal industry reach its full potential. For conference photos, interviews, and related inquiries please contact Don Huff, ECO Strategy, huffd@ecostrategy.ca, 416-972-7401 or (C) 416-805-7720. About OGA: The Ontario Geothermal Association (OGA) is a not-for-profit organization representing geothermal energy system designers, drillers, installers, equipment manufacturers and distributors to advance Ontario’s geothermal heating and cooling industry. The OGA strives to be a bridge between consumers, government and industry professionals while acting as a voice to increase awareness for the importance of working towards the use of a greener, cleaner and self-sustainable energy source.